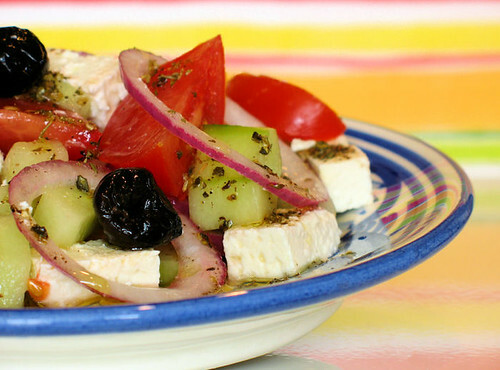 Cherrapeno: Beat the heat with a Greek salad! I could live off Greek salad! Looks lovely. What a great salad Nic...I could do with a crust of bread & a bowlful right this very minute...YUM!! Nothing beats a Greek salad on this kind of weather. Looks scrumptious and quite filling with tuna and crusty bread! It is so refreshing to see a Greek Salad with no lettuce - as it should be. I lived in Greece for several years never saw lettuce in anything. Great pics! That is beautiful Nic! I love tuna, I'd just omit the olive. :) You went to Greece on your honeymoon? Lucky you! Beeeeeaauuutiful salad - do you deliver? i love feta cheese, and hence always a fan of greek salad ! Greek salads offer the perfect combination of flavors, and are obviously best eaten in the summertime. Any salad "beats the heat" I suppose, but few satisfy like the Greek salad. What a lovely salad Nic...The addition of tuna maybe interesting. Gorgeously fresh and simple. 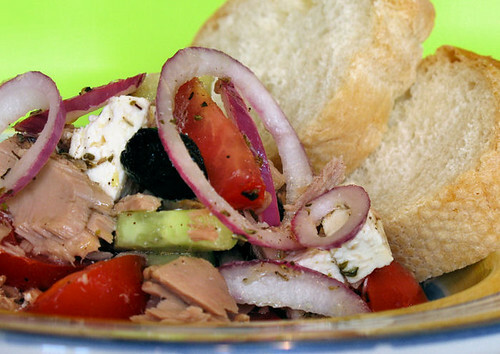 This is perfect for the humid weather, I love a Greek salad in summer and the tuna just gives it an extra something. I can't bear to turn the oven on when it's hot. I love Greek Salad and it's easy yet looks great on the table when you have guests. I like to use Balsamic vinegar in mine. I'm back from holidays and my family reunion. So, it's nice to make my rounds again. Great post and photos Nicisme! Looks like a recipe with crisp and clean flavors. Can't say I've ever had a greek salad before. This looks like a classic. I love Greek salad. Great photo. Fantastic pictures........ great for lunch! Dragon - I bet it did, and tasted even better too! Valli - it was the most wonderful place to go! Beth - isn't it great there? Lore - tuna makes it more filling! David - wellcome! No, I didn't see any lettuce in anything either! Grace - I'll look forward to the round-up! Raquel - yes, give the tuna a go! LyB - not Greece itself, but one of the Greek islands. Giz - ha ha, you wish!! Kate - I'm a feta fan too! Cookinpanda - I agree about the perfect combination of flavours - yum! CollyWolly - you'll have to remember to make one when you get your summer! Helen - me neither, I hate to turn the oven on in the heat. Chuck - oooh, I must try balsamic in mine. Lovely to see you back from your hols!! Jude - welcome and thanks so much for the super comments! Catering equipment - thanks so much for visiting and for the lovely comments! Rosie - thanks and it's great to see you back in blog-land! Patricia - ha ha, my 'little ones' are very stroppy teenagers!!! This is a heavenly salad for sure. Yes you must have the bread for mopping up those delicious juices! oh... i just got back after an entire day of flying... this looks so refreshing that I could just jump into a pool of greek salad. delicious! I love greek salad and yours looks so delish! Greek salad is my favorite salad, eventhough I'm not that much of a salad person normally. Yours looks so yummy and refreshing! 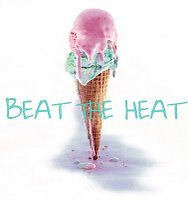 Beat the heat is RIGHT, woman! The high was 114 the other day...and it reached 116! UGH. So salad? Uh huh!! Robin Sue - yes, you must have the bread, and lots of it! Aran, Dee, Maria, Miri and Kristen - thank you all!!! Jeanne - oh I wish it were warmer here, I want some sunshine! Ann - thank you so much! Ann - you poor thing, even though I would like it hotter here, your temps are unbearable! Thank goodness for AC eh? This is on the dinner menu tonight. I make my own rendition, but can't wait to try this one. I could eat it all year long!